- Four Leaf Fishpacking Plant is located on the far eastern shore of Boston, a decent trip east of Diamond City. The neighbourhoods you need to pass through are populated by a mix of Super Mutants, Raiders, and Gunners, and are fairly dangerous. You’ll have the easiest time if you’ve retaken the Castle, as you can basically swim to the Plant with only Rad damage to speak of the experience. - The grounds ‘round the Fishpacking Plant are dominated by Feral Ghouls, and you’ll wind up fighting a fair few once you get on the grounds. You’ll also find Tripwires that are part of the quest Diamond City Blues, and I highly recommend undertaking the quest before coming out here. 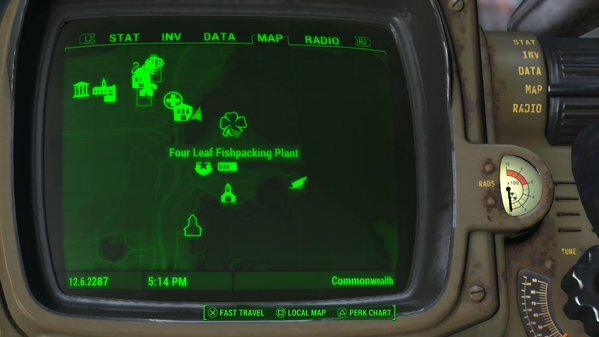 You’ll save some time, and you can get a bit of an advantage for entry if you come through the Plant via the Chems Lab that’s part of the quest. We’ll start at the front door nevertheless. Up the first set of stairs on your left is an Expert locked safe with a bunch of ammo, as well as a Fusion Cell in a generator. There’s a Ghoul watching this small room, so be cautious. Right of the entrance is a production room with a number of Ghouls just waiting to rise up. A Novice terminal in here will not only open the nearby security door, it can activate a Protectron unit to patrol the Plant, attract Ghouls, and kill anything that moves (other than you, of course). The security door locks in some nice boxed items, as well as a Fusion Core sitting on a desk. - Enough dawdling. Also to the left from the entrance you’ll find stairs that descend into the basement. Pop open the door you find and there will be Ghouls waiting. (Protectron will come down here and wipe ‘em out, if you turn it on.) There’s an Advanced locked door straight, and if you go through the door on your left you’ll find more Ghouls. Notable among ‘em are two more powerful Ghouls (Gangrenous and Withered) that can give you quite a bit of trouble if you’re not careful. Take ‘em out at the legs. - The room the Ghouls were guarding branches off in three directions. A small side room to your left is unremarkable; a larger side room up and to the left has a great deal more cool stuff inside; and the door up and to the right leads to a ramp back to the first floor. Done! Can't get this one cleared no matter what I do for Ghoul Problems at Nordgren Beach. Me either. Did you fix this yet? I have cleared it several times.